Simple recipe for delicious dessert straight from Italy. Creamy with a hint of orange flavour tastes simply divine. I’m sure that if you try it once you won’t forget about this recipe. It takes no more than 20 minutes to prepare and it’s not high in carbohydrates. The recipe will give you about 4 portions. If you want really low carb version don’t serve it with the orange syrup. It tastes delicious even on its own. · Combine the gelatine with half the milk in a small bowl and leave it to stand for 10 minutes. · Mix the cream, fructose, remaining milk, vanilla essence and orange zest in a pan. Bring to boil and then remove from the heat. · Whisk in the gelatine mixture until dissolved. · Pour the mixture into 4 moulds and place in the fridge for at least 4 hours. · For the syrup, combine orange juice and fructose in a small pan. Simmer for about 10 minutes until the mixture thickens a bit. 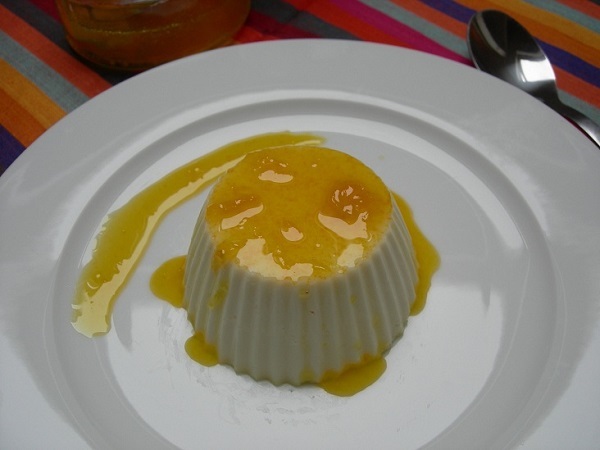 · If you have problem with removing Panna Cotta from the mould, dip it in a hot water for few seconds. Serve with the syrup.